Howdy, there! I hope your weekend is off to a fabulous start. Caleb and I kicked off our weekend by watching way too many episodes of 30 Days on Netflix. Once we get hooked on something, it's hard to break the habit. Good thing our vices are merely television series! Enough philosophical ramblings about my choice - it was darn comfy. I wanted this cardi the moment I saw it. It's perfectly baggy, and I'm actually wearing a sweater underneath, so it provided plenty of warmth. The scarf, which was part of my Christmas gift from Caleb, is super soft, so I quite enjoyed fiddling with it throughout the day. What do you think? Did he pick a good one out? And how are you surviving the cold, lovelies? I was born in the Mediterranean and raised in Texas, so I find myself to be entirely cold-blooded. In other words, I'm freezing my hiney off in this current chill. I suppose it's better to be cold-blooded than cold-hearted, so all is well, I suppose. what a great ruffly scarf and i can totally relate to the crazy weather! 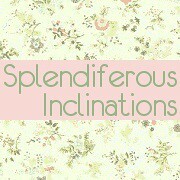 Copyright © 2010-2011 Splendiferous Inclinations.